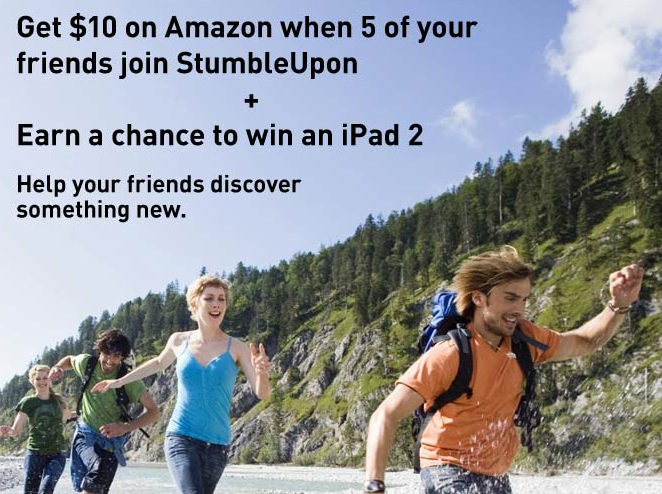 StumbleUpon- FREE $10 Amazon Gift Card for every 5 Friends to sign up! 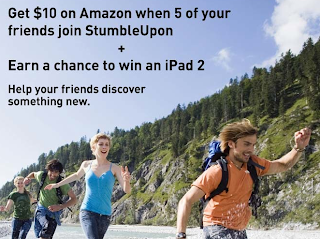 When 5 of your friends sign up for the FREE site StumbleUpon you'll get a $10 Amazon GC! You can share using email, twitter, facebook...etc It's super easy, and all you need to sign up is your name and email address! Once a friend signs up you'll get an email confirming it. Feel free to share your link in the comments below. StumbleUpon is a free website that helps you discover new websites, photos..etc recommended by friends. After your 5 friends have signed up you should get your gift card(s) within 6 weeks to your email. For every five (5) referrals who register for the StumbleUpon Share Program, you will receive one $10.00 Amazon gift card. Sorry, no partial credit. You will only receive a gift card for every 5 Qualified Referrals. Delivery of gift card will be made within 6 weeks. Self-referrals not allowed. Gift Cards subject to terms of card. Gift cards may be delivered digitally to recipient. StumbleUpon is not responsible for gift cards delivered to spam folders and will resend original link, but not replace link. More term details here. Thanks, The Secret to Saving!